Wild: Giganotosaurus furiosa is an enormous predator, larger even than the Tyrannosaurus or Spinosaurus. While greater in size than those storied predators, it can be somewhat less dangerous when encountered in the wild, due to its sluggish speed. Even still, getting cornered or run down by a Giganotosaurus means certain death for nearly any creature. Domesticated: Taming Giganotosaurus is a dangerous prospect. Its rage reaction, even when tamed, can sometimes cause it to briefly turn on members of its own tribe. Indeed it may even throw off its rider if it has been sufficiently angered! And yet, the sheer size and immense power that the Giganotosaurus possesses means that some factions endeavor to tame it as a fear-inducing “capital” beast of war — even at great risk! 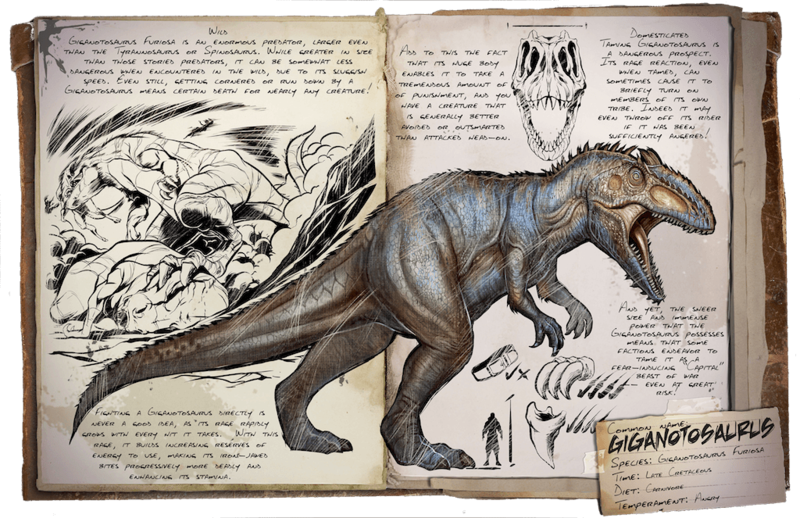 Known Information: Fighting a Giganotosaurus directly is never a good idea, as its rage rapidly grows with every hit it takes. With this rage, it builds increasing reserves of energy to use, making its iron-jawed bites progressively more deadly and enhancing its stamina. Add to this the fact that its huge body enables it to take a tremendous amount of punishment, and you have a creature that is generally better avoided or outsmarted than attacked head-on.